Screen Count and Advance Booking Details of Gold and Satyameva Jayate. Full fledged advance booking of upcoming biggies Gold and Satyameva Jayate has started on Sunday across major cinemas. Screens are still getting allocated and by Monday all India advances will be 'ON'. We will bring detailed advance booking report of both the films by end of Monday or by Tuesday. 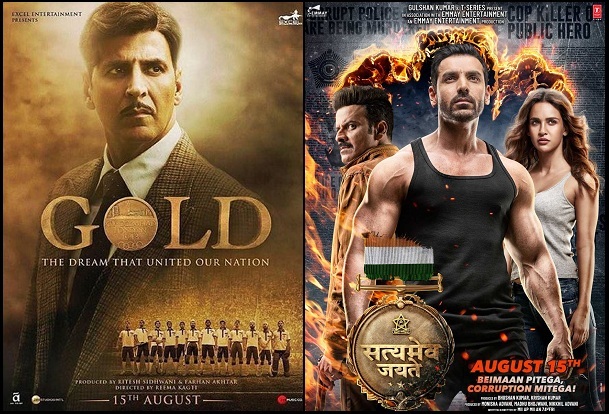 Both film are sure shot to take big opening on Wednesday (Independence Day). Trade is expecting both the films to cross double digit mark. Coming to screen count so far. Gold is expected to lead count this Wednesday and set to get screening of 50% across India. Satyemeva Jayate is expected around 38-40% screening for Wednesday. Rest 10-12% approx will be shared by the rest films. These are early estimates and screen allocation is still going on. Actual screen count will be known closer to the release. Another important point is that Satyameva Jayate has managed to get good screening in multiplexes also. Earlier it was thought that Gold will simply crush SMJ in plexes as far as screening is concerned. In reality that is not the case. As far box office potential. Both films have enough screening to simply rock the box office in this coming extended Holiday weekend. On Wednesday both films will strike big. Thursday and Friday will register drop as both are normal working days. Both films will again get jump on Saturday and Sunday. There is a big opportunity for both the films to do big business specially in 5 days extended weekend, unless they (or anyone of them) receive extremely bad word of mouth from audiences. SMJ will be Super Hit and collect 100cr-120cr LT.